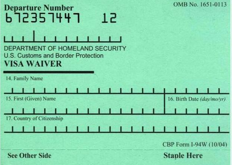 The US Department of Homeland Security (DHS) has said that it will start phasing out use of the I-94W Arrival-Departure Card. Immigration lawyers at Fong & Aquino have been practicing law a very long time, and the I-94 is a venerable old immigration law fixture. It appears that DHS has decided to attune to the times, automating the gathering and review of biographic information about persons entering on the Visa Waiver program.